The Fenceline loop begins further south from the main Otaki Forks carpark. Follow the road on for about 1.5 km beyond the Caretakers house. There is a newly rennovated Fenceline carpark with toilet and large information sign. 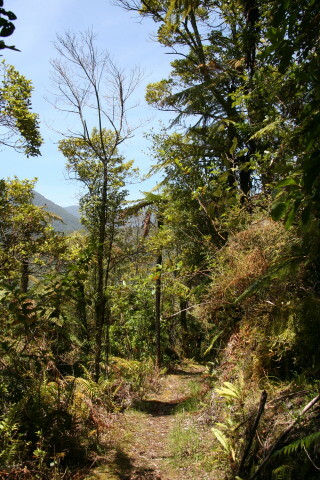 Tracks also lead off from here to Waiotauru walk and Pukeatua Track (to South Mangaone Road). The track climbs gently up from about 150 metres and flattens off to around 280 - 300 metres in bush along the side of the hill. The bush is light in places so there are good views down to the river and across to the Tararua range. There are numerous stream crossings. On the southern side the Pukeatua Track is signposted (7 hours to South Mangaone Road). This track is slightly harder and longer than the Arcus Loop walk, but is suitable for most ages and should take no more than 1.5 hours. The fenceline carpark is about 1.5 km south of the caretakers house and main picnic area, near the school campground at the southern end of Otaki Forks.